The mass killing of migratory birds in Cyprus has reached a record low mainly due to a clampdown on illegal trapping in British military-controlled areas, a conservationist group said Monday. Birdlife Cyprus said its 2018 autumn survey showed a 90 percent decrease in trapping levels with mist nets compared with 2002 when data collection began. "This positive all-time low is mainly due to the progress achieved within the Dhekelia British Sovereign Base Area over the last two years, one of the main trapping hotspots of the island," it said in a statement. Britain retained sovereignty over two military base areas when Cyprus gained independence in 1960, and it has a police force in Dhekelia that tackles poachers. Birdlife said its analysis "shows a positive and continuing decrease in bird trapping levels in Cyprus" but pointed to a "worrisome discrepancy of trapping decreasing in UK military base areas against an increase in the Republic". "While the big picture is one of welcome success and relief for Europe's migrant birds, the increase in killing with mist nets in the Republic recorded in autumn 2018 warns us to keep our feet on the ground," said Birdlife. 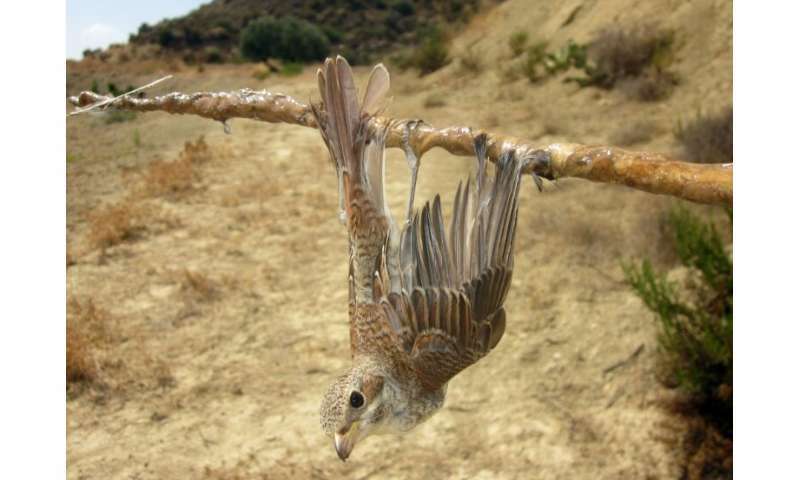 An estimated 335,000 birds were still trapped across Cyprus last autumn, according to the NGO. Birdlife said the decline in the number of birds trapped was down to the approach of police in the base areas. "By increasing police patrols, introducing deterrent sentencing for trappers, enabling covert surveillance work and continuing operations targeting trapping habitat, SBA police played a key role in the dramatic reduction of trapping levels," it said. The group acknowledged efforts by the Cypriot authorities, including the issuing of on-the-spot fines, but it said more needed to be done. "This year's increase in trapping levels in the Republic not only strikes a cautionary note as regards to the dynamic nature of the trapping culture in Cyprus but also reminds us that the trapping problem is not yet solved," said Birdlife. Bird trapping with mist nets and limesticks is a damaging and non-selective practice that affects over 150 species of birds, mostly migratory. The main killing season is autumn when trappers are after protected blackcaps to be sold in Cypriot restaurants as illegal delicacies known as ambelopoulia. "Lack of enforcement against the illegal sale of trapped birds in restaurants and against big, organised trappers remain persistent problems, centred in the Republic," said Martin Hellicar, the head of Birdlife Cyprus.